American multinational Cisco Systems thinks smartphones and tablets are taking over the internet. Cisco Systems' latest forecast has internet-connected mobile devices - smartphones and tablets, mainly - outnumbering the population of the planet in 2013. Moreover, smartphones will dominate the field; in 2013, handsets will account for 50% of the world's mobile data traffic. 2012 was the year things really took off, as global mobile data traffic increased by 70%. That same year was the first time mobile video traffic exceeded 50% of the total usage; so, all those cute cat videos you've been forwarding? You're kinda hogging the bandwidth there, fella. But if 2012 was anything, it was the year of the smartphone. Those little devils only accounted for 18% of total handsets in use, but represented a whopping 92% of total global internet handset traffic. Mind you, it didn't all go Apple's way, as 2012 was also the year that Android overtook the iPhone in terms of level of data use, in the United States and Western Europe. Meanwhile, tablets were kicking into high gear. In 2012 the number of mobile-connected tablets exploded to 36 million, 2.5 times more devices than existed before. Moreover each of those tablets generated 2.4 times more internet traffic than the average smartphone. Wondering where most of that traffic is going? Well, the Middle East and Africa are the biggest new users, and are predicted to achieve 77% annual growth rate year-on-year. Asia Pacific (76%) and Latin America (67%) are next in line. 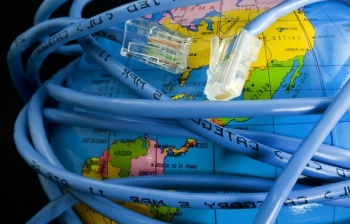 Asia Pacific and North America are expected to be the two major players, and account for about two thirds of mobile data traffic, by 2017.
â€¢ Monthly global mobile data traffic will surpass 10 exabytes in 2017.
â€¢ The number of mobile-connected devices will exceed the world's population in 2013.
â€¢ The average mobile connection speed will surpass 1 Mbps in 2014.
â€¢ Due to increased usage on smartphones, handsets will exceed 50 percent of mobile data traffic in 2013.
â€¢ Monthly mobile tablet traffic will surpass 1 exabyte per month in 2017.
â€¢ Tablets will exceed 10 percent of global mobile data traffic in 2015.